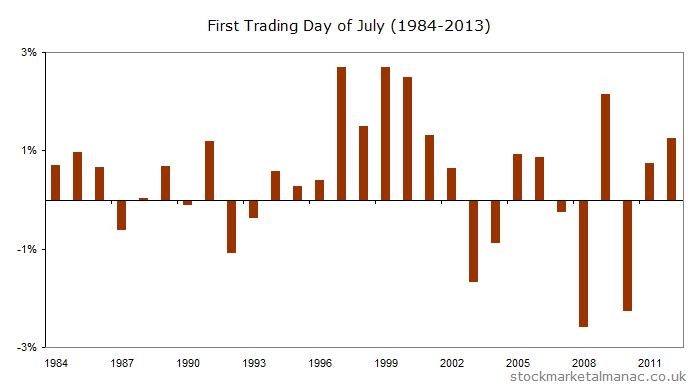 Tomorrow will be the first trading day (FTD) of July. Since 1984, the FTSE 100 Index has an average return of 0.48% on the July FTD (16 times the average daily return on all days), which makes it the third strongest FTD of the year. Although, as can be seen in the chart, the market has suffered two large falls in the past five years on this day. 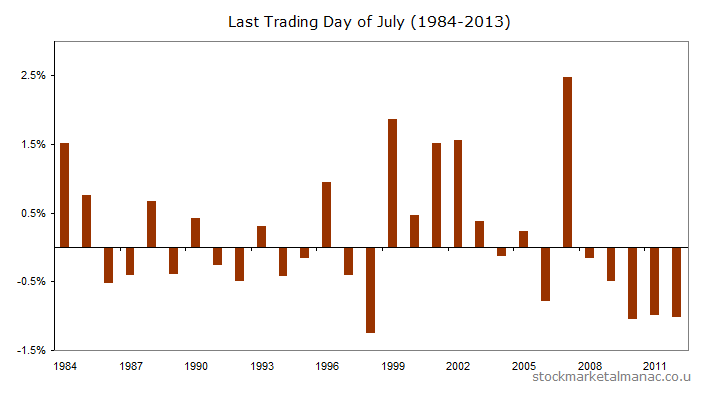 The following chart shows the returns for every July FTD since 1984. The following table lists the five FTSE 350 shares that have the best returns in July over the last ten years. For example, Greene King has an average return of 7.3% for the month of July. Each stock has risen in July in nine of the past ten years, while Greene King is the only FTSE 350 stock to have risen in July for all the last ten years. The following table lists the two FTSE 350 shares that have the worst returns in July over the last ten years. For example, Petra Diamonds has an average return of -6.6% for the month of July. Both stocks have fallen in July in eight of the past yen years. An equally-weighted portfolio of the above strong July stocks would have out-performed every year an equally-weighted portfolio of the above weak July stocks by an average of 12.4 percentage points each July for the past ten years. The following chart plots the average performance of the FTSE 100 Index during August since 1984 (more info on this type of chart). As can be seen, on average the market tends to trade flat for the first couple of weeks and then to rise gently in the second half of the month. The average chart for June was posted a month ago here. The following reproduces that chart and overlays the actual FTSE 100 for July 2013. Tomorrow will be the last trading day (LTD) of July. Since 1984 the market has on average risen 0.14% on the LTD of July, which makes it 5th in the ranking of month LTDs. Since 2000 the average change on the July LTD has been 0.15% – largely unchanged, with positive returns in 46% of those 13 years. 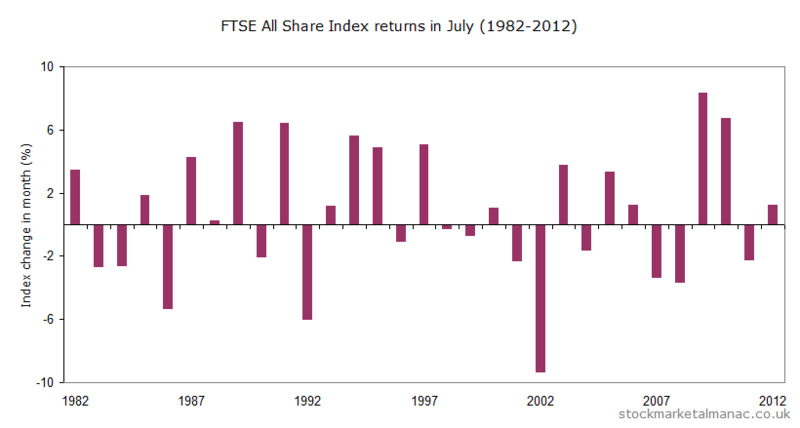 The following chart shows the FTSE 100 Index returns for every July LTD since 1984. The following chart plots the average performance of the FTSE 100 Index during July since 1984 (more info on this type of chart). 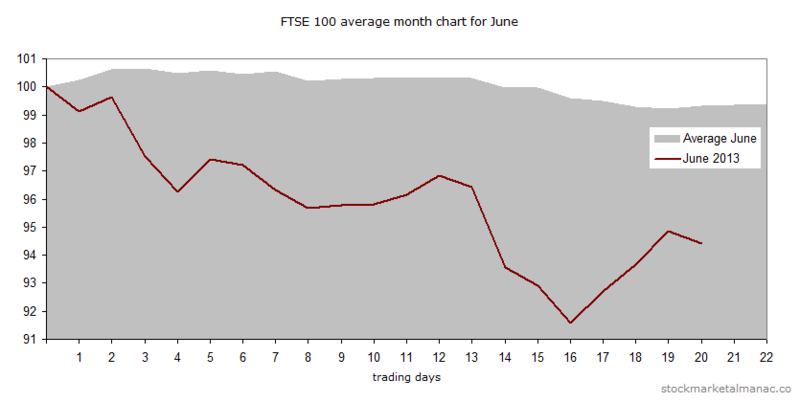 The chart shows that on average, the market rises for the first week of July, then drifts lower for the following two weeks, but ends strongly in the final week. The average chart for June was posted a month ago here. The following reproduces that chart and overlays the actual FTSE 100 for June 2013. 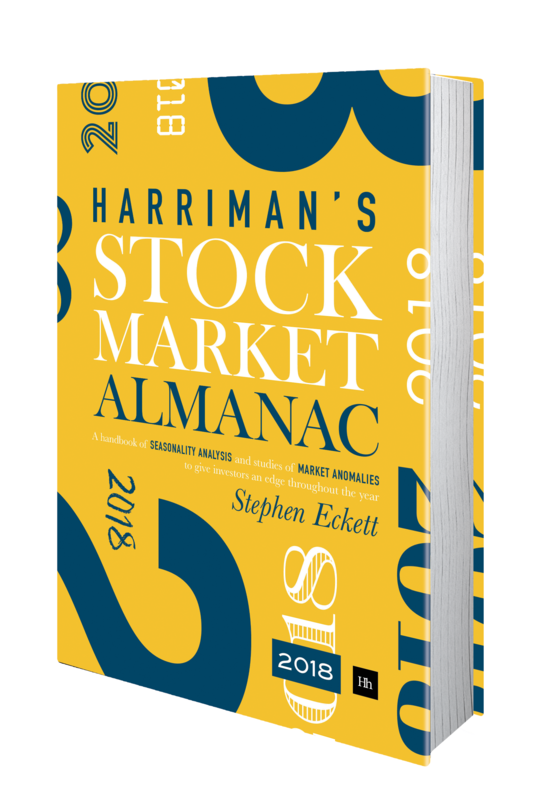 In an average June the market is weak; this was true also in 2013, but the market was much weaker than in an average year. Next Monday will be the first trading day (FTD) of July. As explained in the 2013 edition of the Almanac, the market has a tendency to be strong on the FTD of a month. And this effect has been even more pronounced in recent years. Along with April, the July FTD has been the strongest FTD of all 12 months: since 1984 the FTSE 100 Index has increased on average 0.44% on this day. Although from 2000 the average return on the day has been weaker at 0.21%.